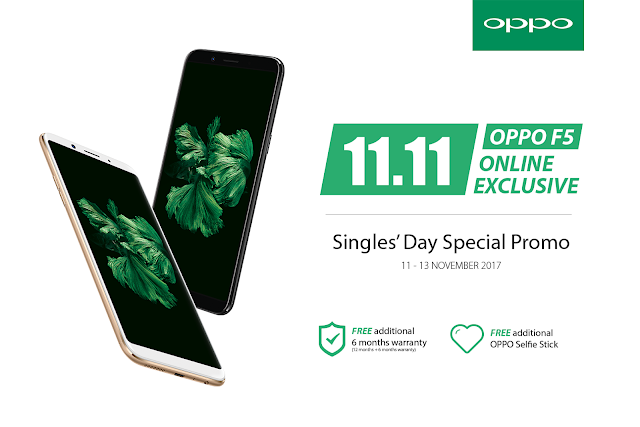 OPPO Malaysia and its e-commerce partner, Lazada has offered fantastic online promotions lined up to celebrate the annual 11.11 single day. Every customer who purchased OPPO F5 from OPPO Official Online Store or from Lazada will be getting a complimentary selfie stick and an additional 6 months warranty for their F5 from 11th November – 13th November 2017. Surprises don’t end there. The price of F1s will be reduced to RM698 on Lazada which is exclusively for 11.11 Singles’ day only! OPPO A77 has also got a price cut of RM300 and is now selling at RM998 on OPPO Official Website and Lazada! Priced at RM 1,298, the new OPPO F5 features 20MP front camera with f/2.0 aperture and A.I. Beauty Recognition technology, users can finally bring their selfie photography experience to a whole new level. The company has also announced that the OPPO F5 celebrity team members such as Eric Chou, Min Chen and Fattah Amin will be joining the F5 first sale roadshow on 11th November 2017 at Sunway Pyramid (KL), Sunway Carnival Mall (Penang) and Aeon Bandar Dato Onn (JB). Grab your most loved OPPO device now from OPPO Official Website or Lazada before it’s sold out!